What “LOVE” means to you? Tell Hallmark Channel by uploading a 30-second video explaining what “love” means to you on Facebook, Instagram, or Twitter using #HFCarContest and be entered for a chance to win the Home And Family Ford Edge SE Facebook Giveaway. Each video will be judged on talent, content, and creativity and the winner of the 2nd Annual Car Giveaway will drive home a 2017 Ford Edge valued at $32,000, courtesy of Shults Ford Lincoln – Wexford! 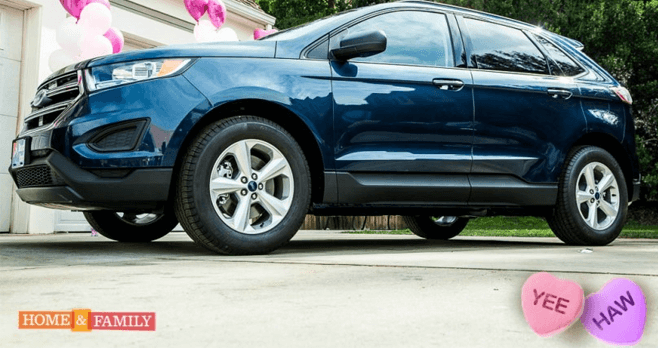 What You Need To Know About The Home And Family Ford Edge SE Facebook Giveaway? Eligibility: The Home And Family Ford Edge SE Facebook Giveaway is open to all legal residents of the United States and District of Columbia who is 21 years of age or older at the time of entry. Sweepstakes Period: Begins on February 3, 2017 at 12:00 a.m. PT and ends March 26, 2017 at 11:59:59 p.m. PT. Limit: Limit one video submission per social media platform per day. Random Drawing: After the end of the Contest Entry Period, a panel of qualified judges determined by Sponsor in its sole and absolute discretion will select the one best Video from among all eligible Video that were submitted, based on best performance. On or about April 15, 2017, Sponsor or Administrator will contact potential winner using the contact details provided with entry. Grand Prize (1): A 2017 Ford Edge SUV. The ARV of the prize is $32,000.00. Winner’s List: For Contest results send a hand-printed, self-addressed, stamped envelope to Winners List – Home & Family Ford Edge Contest, c/o: Home & Family, 1757 Ventura Boulevard, #206, Encino, California 91316. Requests for the winner list must be received by April 31, 2017. Sponsors: Woody Fraser Enterprises, Inc., 1757 Ventura Boulevard, #206, Encino, CA 91316 and Crown Media United States, LLC, 12700 Ventura Blvd., Studio City, CA 91604. Administrator: Woody Fraser Enterprises, Inc., 1757 Ventura Boulevard, #206, Encino, CA 91316. For more information on the Home And Family Ford Edge SE Facebook Giveaway, including official rules, visit https://www.facebook.com/HomeandFamilyShow/app/1577161592294313/ now! HomeAway Sweepstakes 2017: Win A Stay At Duns Castle!